Macquarie Bank is a provider of credit cards, home loans, car loans, bank accounts, investment products, and business banking products. If you’re considering taking out a credit card from Macquarie, check out what’s on offer with our comparison table, based on a monthly spend of $2,000. Macquarie Bank Rewards: Macquarie Bank’s own rewards program. Rewards points are redeemable for a wide range of reward types. Qantas Frequent Flyer Rewards: Macquarie Bank’s tie-in with the Qantas Frequent Flyer program, allowing you to earn Qantas points on transactions. Rewards points are redeemable for frequent flyer travel rewards such as flights, upgrades, accommodation and tour packages, and much more. Hilton HHonors: A joint venture with the Hilton group of hotels, the HHonors rewards program is only available on the Macquarie Bank Platinum Card. It brings you free weekend stays, upgraded Gold or even Platinum status at Hilton hotels, interest-free payment plans on some purchases, and much more. Macquarie Bank Rewards: Earn 2 Macquarie Bank Reward points per $1 spent. At the time of writing, a bonus applies – earn 60,000 Macquarie Bank Reward points when you spend $3,000 within your first 60 days. Qantas: Earn 1 Qantas point per $1 spent up to $4,000 per statement period, then 0.5 Qantas points thereafter. At the time of writing, a bonus applies – earn 40,000 bonus Qantas Points when you spend $3,000 in the first 60 days. Macquarie Bank Rewards: Earn 1.25 Macquarie Bank Reward points earned per $1 spent. At the time of writing, a bonus applies – earn 40,000 Macquarie Bank Reward points when you spend $2,000 within your first 60 days. Qantas: Earn 1 Qantas point per $1 spent up to $1,000 per statement period, then 0.5 Qantas points thereafter. At the time of writing, a bonus applies – earn 40,000 bonus Qantas Points when you spend $2,000 in the first 60 days. Hilton HHonors: Earn 4 HHonors points per $1 spent at Hilton hotels, and 1 point per $1 spent on all other purchases. Free weekend night stay valid at over 4,600 Hilton properties when you spend $12,000/year. Automatic HHonors Gold status, upgradeable to Diamond if you spend $40,000/year. 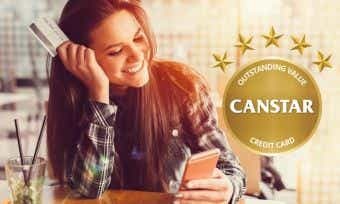 To apply for a Macquarie Bank credit card, you can compare credit cards on the Canstar website and apply for the card of your choice on the Macquarie Bank website. You can also call 1300 150 300 to apply over the phone or ask questions of a Macquarie Bank credit card specialist. How do I activate my Macquarie Bank credit card? If your application is successful, you will need to activate your card before you can use it to make purchases. You can activate your card by logging into Macquarie Bank Online and following the prompts to enter your card’s details into your account. Can I manage my Macquarie Bank credit card online? You can manage your Macquarie Bank credit card using Macquarie Bank’s Online Banking service, or by downloading the Macquarie Bank app to your smartphone. Both services let you track your spending categories, check your statements online, and much more. How is interest calculated on my Macquarie Bank credit card? Interest is charged on purchases when you carry a balance on your Macquarie Bank credit card. Interest is charged on cash advances from the date of withdrawal. Interest is calculated daily, based on the balance you have outstanding on each day of the statement cycle, and billed monthly on your credit card statement. Up to 55 interest-free days apply on Macquarie Bank credit cards. These interest-free days apply when you have paid the balance in full for the previous month as well as the current month’s statement. What will my credit limit be on my Macquarie Bank credit card? Your initial credit limit is set out in your application based on the information that you provide. You can apply to increase or decrease your credit limit at your own discretion, and Macquarie Bank can approve or reject this request based on their lending criteria. How do I close my Macquarie Bank credit card account? You can close your Macquarie Bank credit card account by logging into online banking and selecting the ‘Close Account’ option. You will need to repay your credit card balance in full in order to close your account. Macquarie Bank was founded in 1969 with just three staff members in a Sydney office. Today, it is a multinational financial group that provides a wide range of financial services in consumer and business banking in over 27 countries. According to their website in 2017, Macquarie Bank boasts an impressive record of 48 years’ unbroken profitability. Carbon neutral since 2010, Macquarie Bank also aims for sustainability in its environmental impact, provision of a safe and diverse workplace, and ethical governance.